If we walked to the end of their short driveway we could see the beautiful Atlantic Ocean. Paul and Gunnar getting settled into Pelican’s Perch. A short distance further and we could walk along the almost secluded beach. I love walking the beach looking for anything that may have washed up overnight! 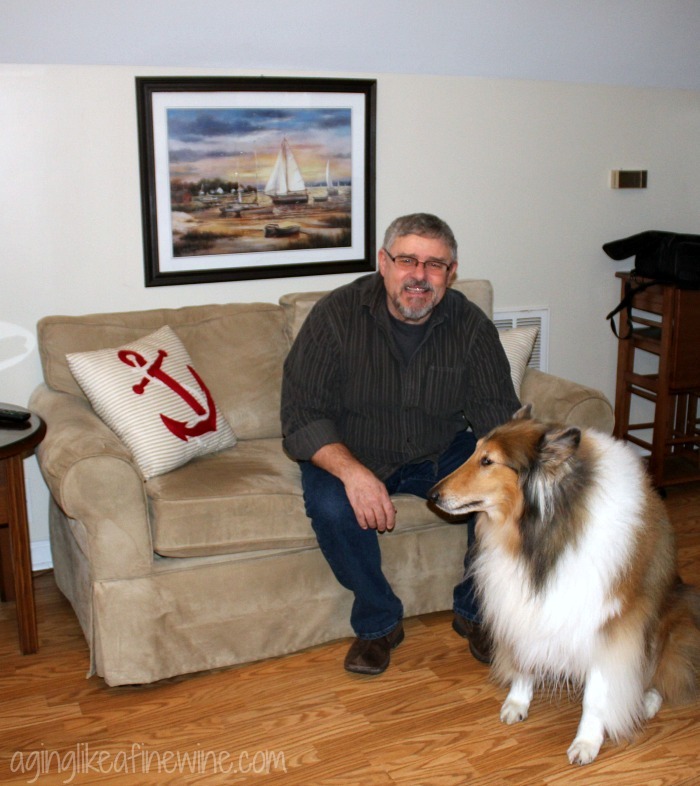 We took our collie, Gunnar along and he loved it. At this time of year because of few people on the beach, dogs can be taken off their leash and allowed to explore. As I said, Gunnar loved it and I don’t think he wanted to come home. In fact, he has seemed a little depressed! Oak Island is home to fewer than 8,000 residents and is not overly commercialized like its southern neighbor, Myrtle Beach, SC. It’s separated from the mainland by the Intracoastal Waterway. The island itself has one grocery store, a Food Lion but within minutes you can have access to a variety of other shopping. One of the charms for me is that there aren’t any of the chain restaurants that we are all so accustomed to. They’re all locally owned individual restaurants and trust me, we enjoyed checking out many of them! 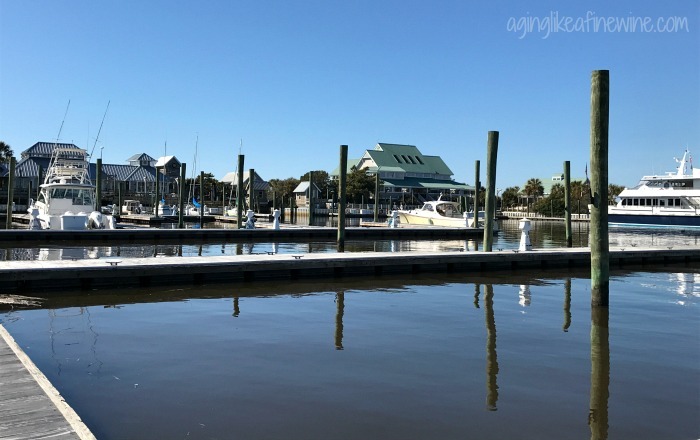 We arrived Saturday afternoon and after getting settled into Pelican’s Perch we took a drive to get a feel for the island and pick up a few things at Food Lion. 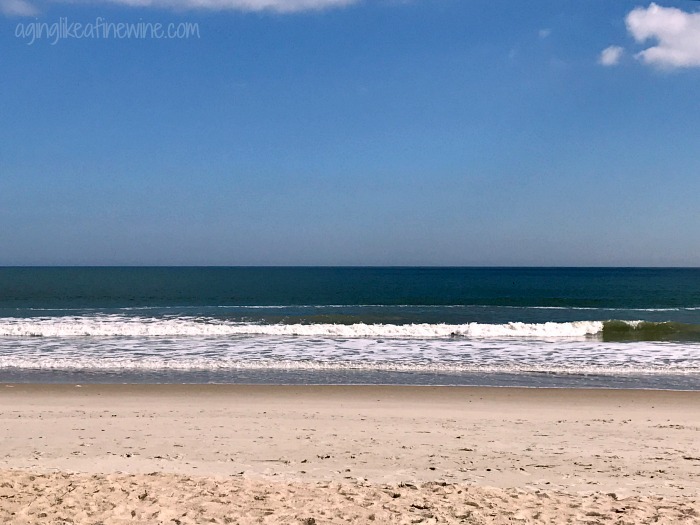 We drove out to Caswell Beach to get a look at the Oak Island Lighthouse and after the lighthouse, we drove the short distance to Southport, NC to check out the ferry landings. Southport is a very cute, historic town. The main street is lined with cute shops and places to eat. Remember the movie “Safe Haven” based on the book written by Nicholas Sparks? It’s the town of Southport that is featured in that movie. 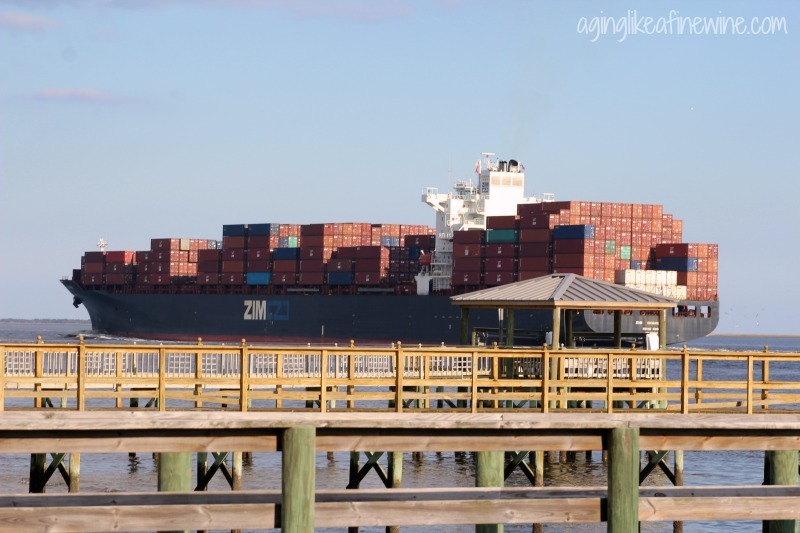 While we were there we were able to watch this huge cargo ship making it’s way up the Cape Fear River to the Port of Wilmington. 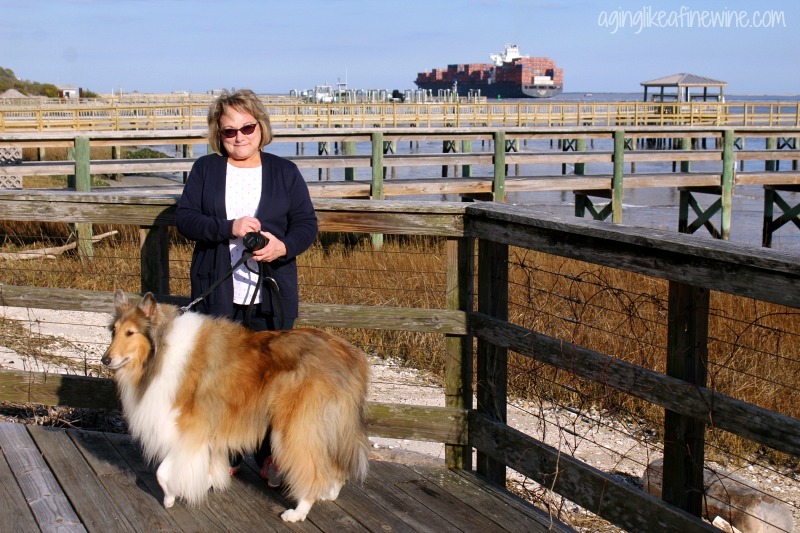 Gunnar and I in Southport overlooking the Cape Fear River. The next day was a rainy Sunday and was also Super Bowl Sunday. We love to watch the super bowl so we ventured out in the rain early in the day to pick up some supplies and food at the local Walmart and then just spent a relaxing afternoon and evening in the apartment watching the game. 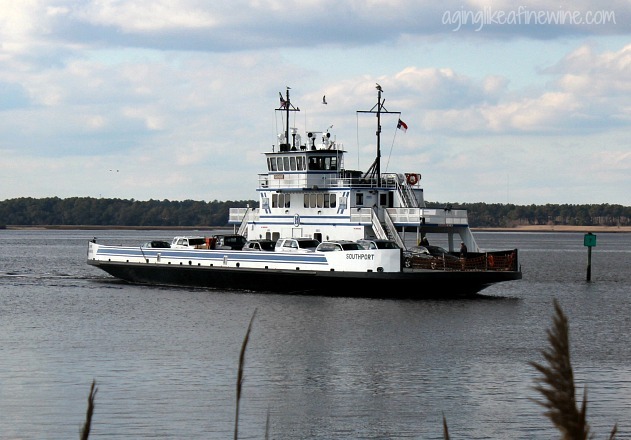 The following day was bright and sunny and in the 60’s so we decided to ride the ferry from Southport over to Fort Fisher and visit the North Carolina Aquarium. I love to ride ferries! My sister lives in Washington and one of the things I always enjoy when I visit is the ferry ride. This ferry was much smaller but was still fun and we saw some dolphins on the way! I get excited about wildlife! The North Carolina Aquarium at this location is small but very clean and nice. 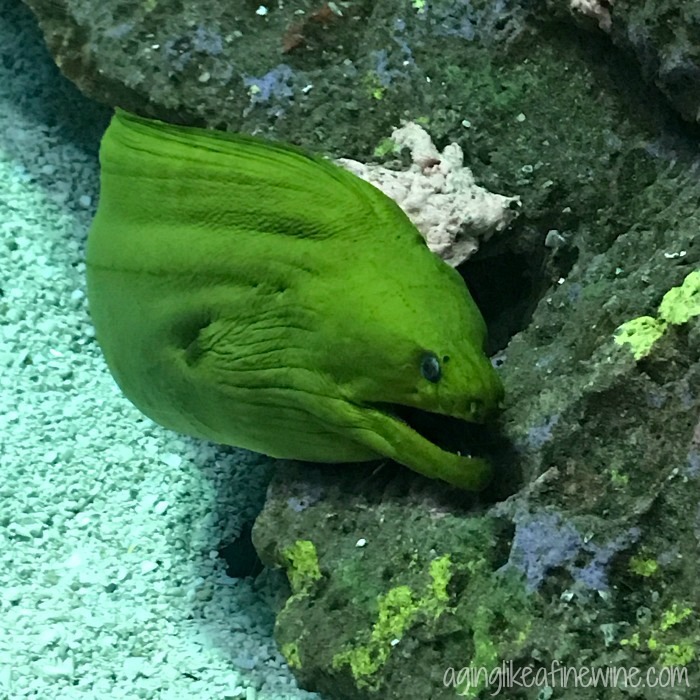 Look at the gorgeous green color of this eel. 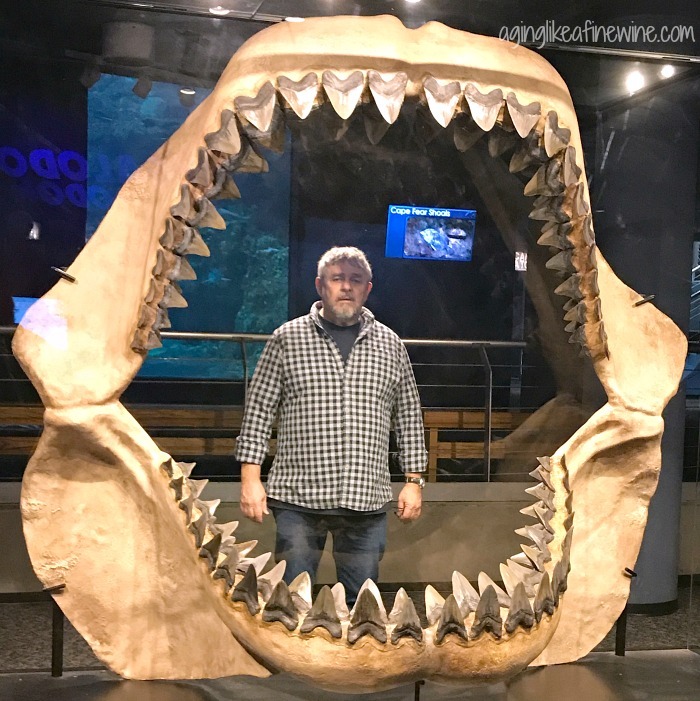 And Paul was nearly eaten by a megalodon; who knew they were still alive! We ended the day with a very delicious BBQ dinner at the Bar-B-Que House. 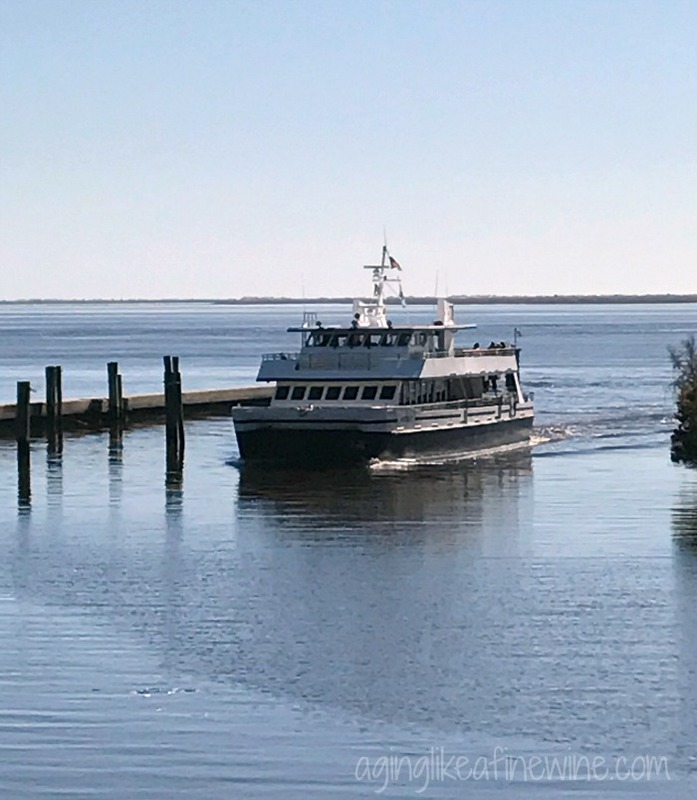 The next day was also a bright sunny day with temps in the high 60’s so we took advantage of the weather and rode another ferry out of Southport over to Bald Head Island. This ferry only carries passengers, no vehicles. In fact, you cannot have a car on Bald Head Island. The only vehicles there are service vehicles. All of the inhabitants and visitors on the island either walk, bike or drive a golf cart. The small marina where the ferry docks is pretty and has beautiful homes and some restaurants around its perimeter, but I was very disappointed to find out that none of these restaurants were open at this time of year. The golf cart rental company was open though, yeah! So we rented one and tootled around the island which Gunnar wasn’t very thrilled about. We had him sit on the floor between us in and since he is a big dog, is was rather squishy in that golf cart and he kept watching the road just waiting for the opportunity to make his exit! 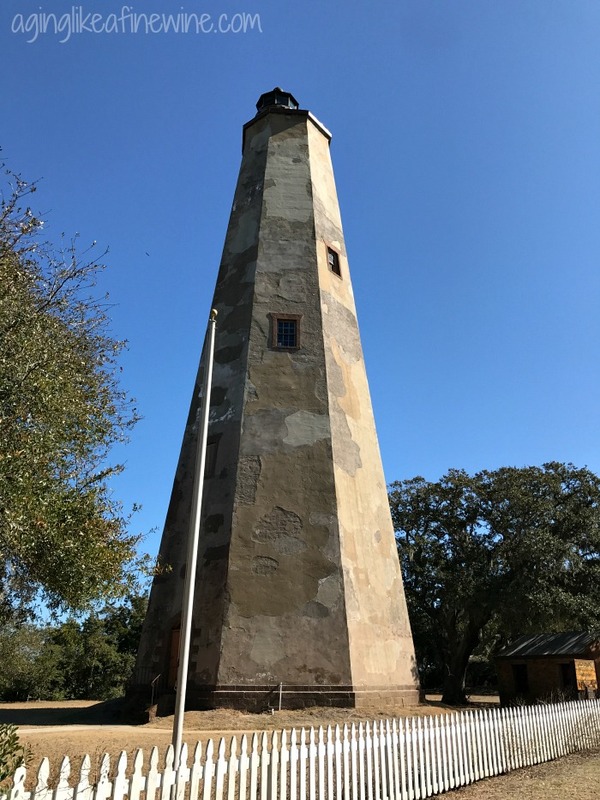 Old Baldy Lighthouse, built in 1817 on Bald Head Island. We drove back to Oak Island for dinner and stopped in at Turtle Island. This one fills up fast so if you don’t arrive fairly quickly after it opens, expect to wait for a table. The following day we drove down into South Carolina as far as Murrell’s Inlet. 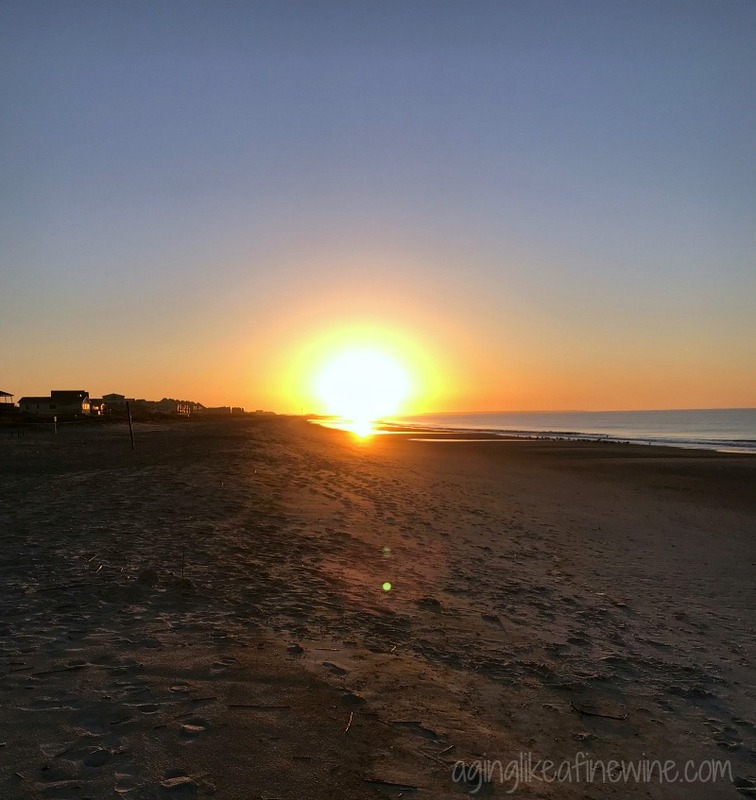 I’ve shared this special place with you once before on a trip to North Myrtle Beach. Murrell’s Inlet lies, as the name implies, on an inlet and is lined by restaurants linked together by a boardwalk. Fun places like the Dead Dog Saloon, Drunken Jacks, the Wicked Tuna, and The Claw House to name a few. 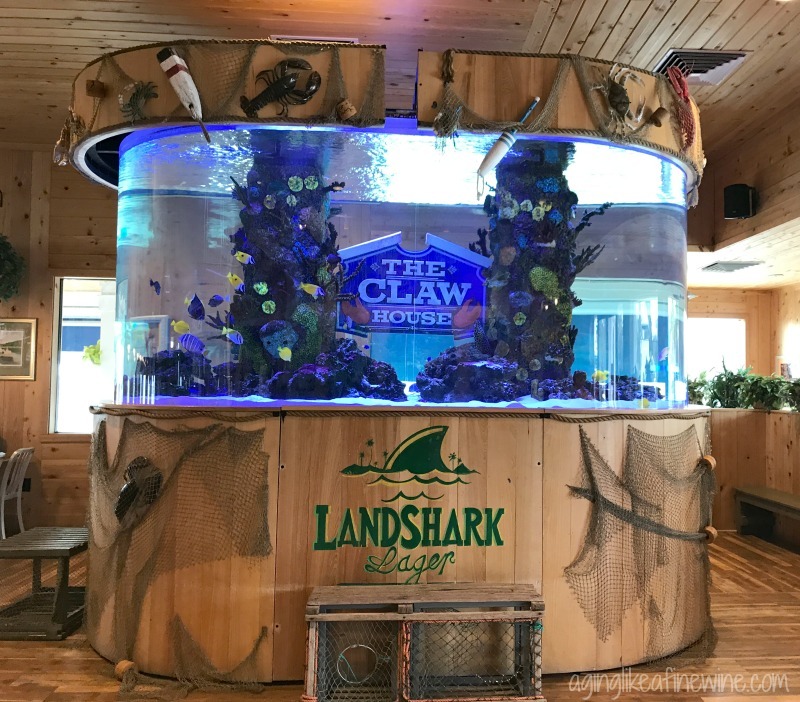 The Claw House contains something very special, an aquarium specially made for them by Brett Raymer and Wayde King, owners of Acrylic Tank Manufacturing and the stars of the Animal Planet show, “Tanked”. We also stopped at Surfside Beach and walked a little ways on the beach watching the gulls and the waves. 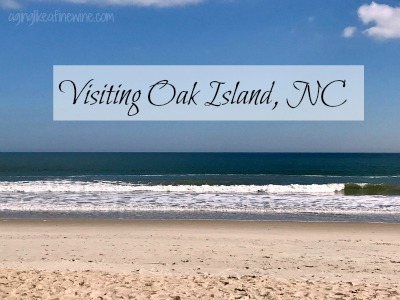 On Thursday we just enjoyed Oak Island and walking along the beach. Thursday evening we enjoyed a very nice dinner at the Island Way restaurant. It sits right at the end of the Ocean Crest Pier and you can enjoy the ocean as you dine. The sun was setting as we were eating and I was able to snap this beautiful picture. It’s an 8-hour drive for us from Oak Island, NC to home so the next morning we were up early and all packed and ready to go. We headed down to the beach to see the sunrise first. Vacations always seem to go so quick! 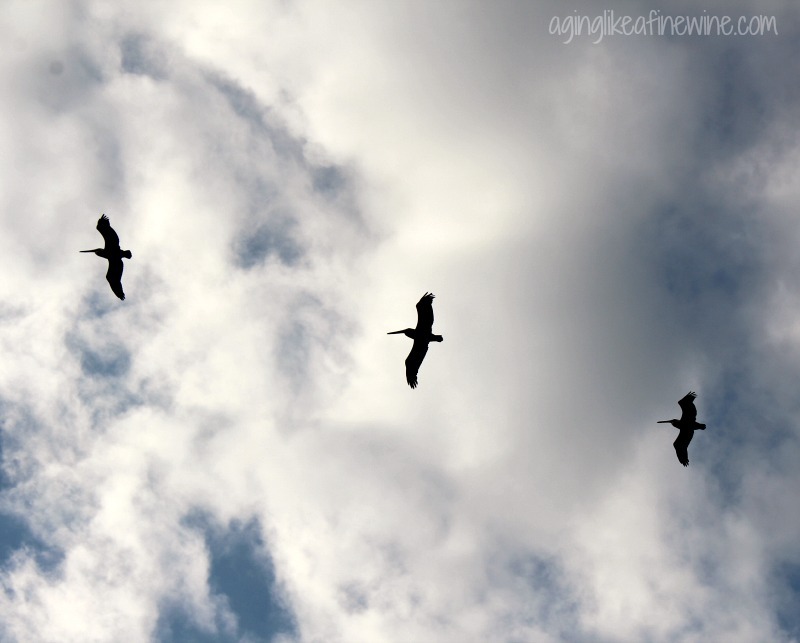 You look forward to them, plan for them and save for them and before you know it you’re on your way home once again. But as they say, there’s no place like home! 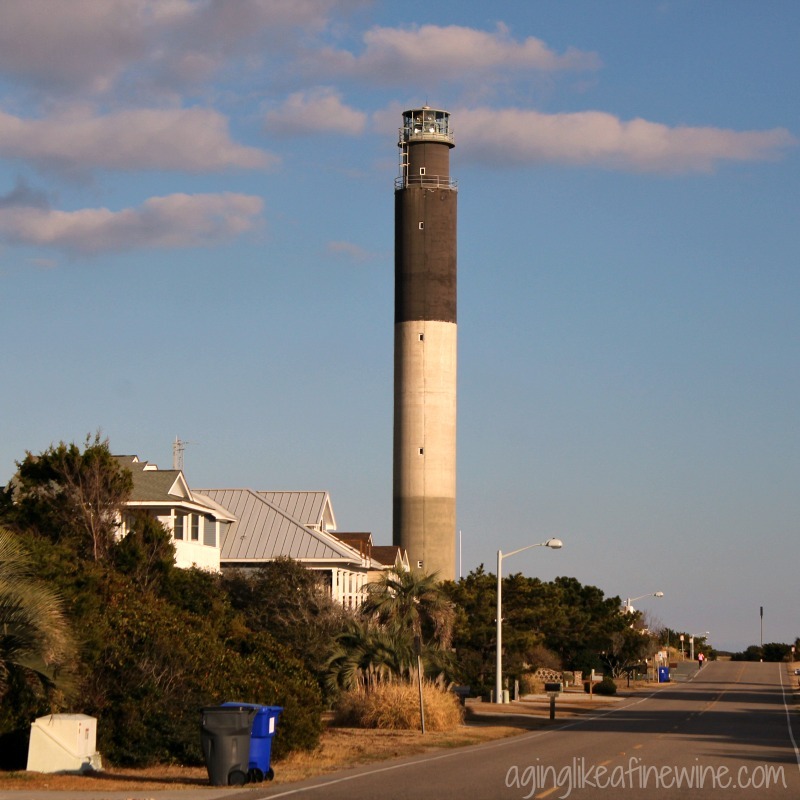 Have you been to Oak Island or Southport or have you seen the movie, Safe Haven? 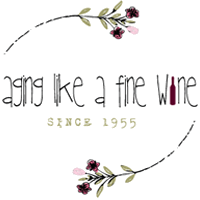 This post will be shared on some of the great link parties found on my “Where I Party” page. Thanks for including me on your vacation! Your descriptions and photos make me believe I really was there! Gunnar looks good, and y0u and Paul always do! Thank you Nina! We need to make that trip to Mackinac Island! I haven’t been to Oak Island but we have been to the North Carolina Aquarium! It looks like a really relaxing vacation and I love the idea of vacation away from the mainstream. I do too. Even though Myrtle Beach, SC is a favorite vacation spot of many, it’s too much for me with large resorts lining the beach. Oak Island and the Outer Banks don’t have those, although the Outer Banks does have huge rental vacation homes. Thank you for stopping by! 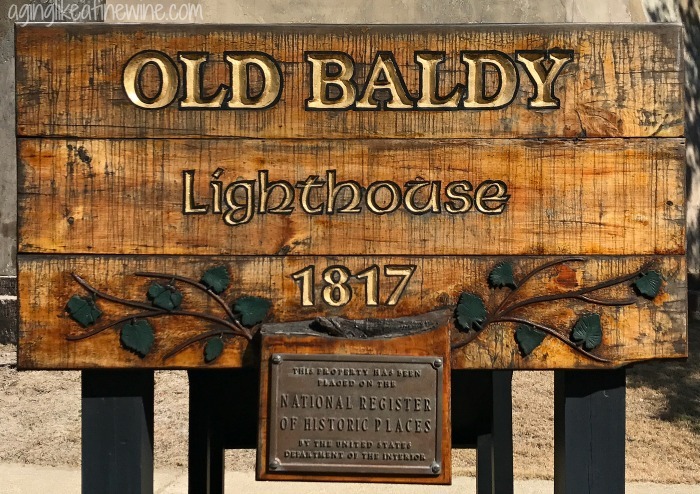 What a gorgeous group of places to visit – and those houses on Bald Head Island were quite spectacular. 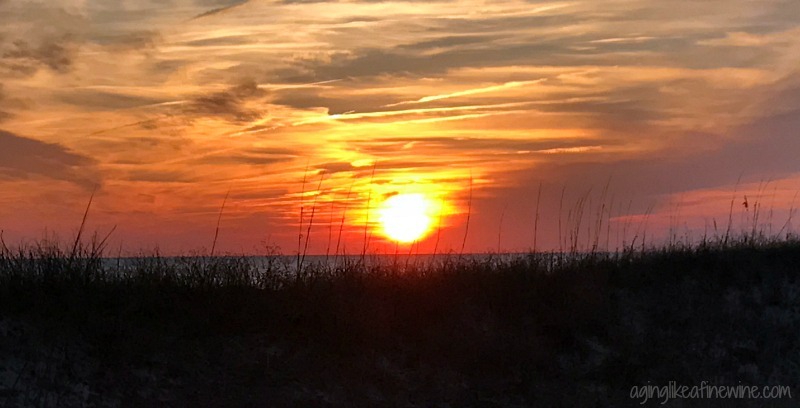 I’ve pinned your sunset pictures to my sunsets board and shared this on my SM – it sounds like a beautiful holiday for you both. Thanks Leanne! It is a very beautiful place and it was a very good time for us. I also love the Outer Banks of North Carolina.